When I say ‘Introverts”: ‘shy’, ’loner’, ’socially awkward’ are some of the words that come first thing in our mind. Though this is true but it’s not the whole story!! Introverts will say no to a party to finish a book they started reading, they will do anything to avoid saying a simple “hi” to a stranger, they will love a cup of coffee in a closed room than to have a tea party with a room full of people. We don’t blame them for that. Everyone is different and everyone is to be respected for who they are. Grab a cup of coffee, scan your mind and write it down on a piece of paper in a closed room. Now, that’s when an introvert will scream “Heaven do exists!!”. If you have a flair for writing, be a copy writer, a content writer or an author. Go out and get some freelancing work, it doesn’t require any formal education but a constant motivation is needed. Your writing business needs a little investment and if done right, can give you loads of money in returns. The only key is: market yourself properly and establish networks then only your name will come out, which is necessary to have a thriving writing business. This work required extreme level of focus or concentration as, the matter of someone’s finance cannot be taken lightly, and that’s where your introvert personality will come to the rescue. Being an introvert, you love doing a job that needs to done all alone with focus and most importantly, no human contacts. If you are well versed with trending technology, there are many people out there that are in need of your skills. Gear up and go out there, offer people the tech support they need and earn some money. If you love creating or designing using technology, graphic designing or web designing for instance will be the right option for you. Don’t worry, if you don’t have any professional degree in these, self learn graphic or web designing. It can simply be put in this way, know what you can do, hone your skills and offer top-notch services to the needy. With little investment, get your business started with a bang. Photography is another beautiful profession that needs lots of focus, concentration and do not forget the persistence and patience that it needs (sometimes you have to wait for hours before you take that perfect shot). If you are an introvert, chances are you already are the master of all those qualities. So, go and grab a camera, start clicking the world around you, shoot for websites, publications or news channels, sell rights of your photos. You can start giving lectures or organize classes to teach, if you become really skilled. Another greatest feature of being an introvert is: the listening skills and deep understanding level. Why not use your characteristic traits for a better cause: for helping people in nee! Lend them your ears, listen to their problems and try to console them and solve their problems. Yes, you can be a life coach; a person that people seeks during their rough times. Get a good coaching training or self learn them, and start your business around it. Explore your intelligence and share your knowledge with the world by tutoring them online. Provide personal assistance, teach or help students with their projects. Online tuition can be done sitting in the comforts of your home, you can communicate with students via emails or Skype. It is a common theory that: most of the introverts are highly creative so, why not put their creativity for the best use and earn few bucks out of it. If you are great at sketching, painting, sculpture or any other form of art you excel at, go online and start teaching your art, share your knowledge. You get a chance to continue doing what you love to do, improve your caliber, share the knowledge, and earn some money and that too from your home. That’s what a perfect business for an introvert. As we already know, introverts makes great artist. So, if music strums within your veins then make it your way of living. You can write music for different music labels, recording artists, musicians and for studios. IF you are really good with your talent, you can make a great living out of it. If baking cupcakes and cookies tops the things you love to do, doing it as business will make your business a success. This is another business that could be great of an introvert as it allows them to works off screen that is behind the curtains, the best place an introvert wants to work. You can do the baking while others can do the selling and distribution for you. Being an introvert does not limit you to staying in closed door all day! 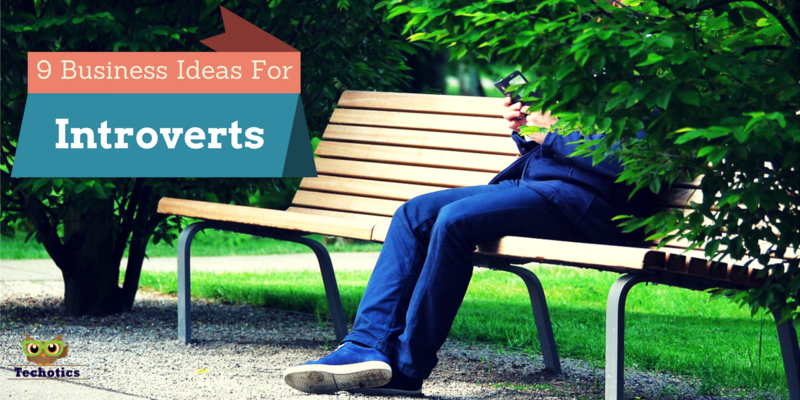 There are a lot of business ideas that are made for introverts and I am pretty sure you will agree to it. Let me know what you think about these ideas. If you have more to add to this list, feel free to comment! !